The French Bulldog, with his squat stature, his oversized ears (that are often referred to as “bat ears”, and his adorable face, is one of the most beloved canine breeds. If you are looking for a playful, intelligent, loving, active, and very adaptable dog, then you should definitely consider bringing a French Bulldog into your family. Just one look at a Frenchie (as they are affectionately called) and you will be sure to swoon with delight. Not only are French Bulldogs beyond adorable, but they are pretty easy to care for. Of course, like any other breed, they do require the basic essentials, like a properly fitting dog collar and dog harness for regular walks; a comfortable and supportive dog bed for his daily slumbers; and of course, some fun puzzle toys for dogs and interactive dog toys to keep him content. Oh, and you do want to make sure that you groom in by giving him a wash down with a high quality dog shampoo, and clip his nails with a decent dog nail clippers, too; however, the needs of Frenchies are pretty basic and they really aren’t a high maintenance breed. When it comes to caring for your French Bulldog, there is one area that you definitely don’t want to slack in; and that’s feeding. Like all canines, French Bulldogs have specific dietary needs and it’s important that you are feeding him a high quality dog food that will meet those needs. By filling his dog bowl up with highly nutritious food, you can ensure that he is getting the vitamins, minerals, and other essential nutrients that he needs to live a long, happy, and healthy life. But, there are so many different dog food brands and formulas on the market that it can be hard to decide what you should feed your Frenchie. Does he require a dry dog food, a wet dog food, a dog food for sensitive stomachs? And, what exactly are the nutritional needs of this dog breed? In this review, we’ll answer all of these questions; but first, let’s go over some of the best dog food options for French Bulldogs. Now that you have had a look at our top choices for the best French Bulldog dog food, let’s take a closer look at each one. Below, we offer a more detailed overview of each recipe, including the ingredients that they contain, why they are a great choice for Frenchies, what we like about them, and what pet parents who have used these foods have had to say. After you are finished reading through the reviews and decide on an option that you feel will best meet the needs of your furry friend, click on the buttons to find the best prices currently available Chewy and Amazon. The first option on our list of the best dog food for French Bulldogs is Royal Canin’s Breed Health Nutrition Bulldog Adult Dry Dog Food. Royal Canin dog food has long been hailed as one of the best dog foods on the market by pet parents because the manufacturer makes a variety of formulas and uses the very best ingredients to ensure that the nutritional needs of dogs are being met. This option is made specifically for French Bulldogs. The kibble is designed exclusively for this breed, as it is easier for them to pick up and encourages chewing, thereby promoting better dental health. French Bulldogs have a short muzzle, which can make it difficult for them to pick up food and keep it in their mouths; however, because of the unique shape and size of this kibble, your pup should have no trouble eating it. That’s not the only reason why this food is an excellent choice for French Bulldogs; it’s also made with highly digestible proteins and the right amount of fiber from the best sources of carbohydrates, thereby preventing gastrointestinal issues like bloat, which Frenchies are prone to. It also contains fatty acids to nourish the skin, something that can be problematic for French Bulldogs, as their skin tends to dry out. And, it’s also made with other essential nutrients that this breed needs to thrive. The ingredients featured in this recipe include brown rice, salmon oil, beet pulp, chicken, and other tasty ingredients that are highly nutritious. According to the reviews that we read, the majority of pet parents are very pleased with the product. They say that they have noticed a marked difference in skin health and joint health. 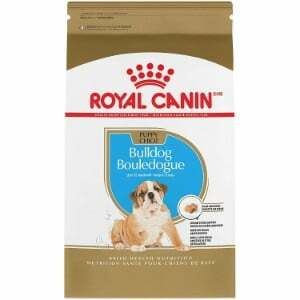 Final Verdict: For a well-balanced, highly nutritious dog food for your French Bulldog, you can’t go wrong with Royal Canin Breed Health Nutrition Bulldog Ault Dry Dog Food. 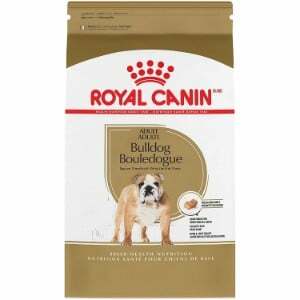 We were so impressed with Royal Canin that we decided to also included their Breed Health Nutrition Bulldog Puppy Dry Dog Food formula on our list. This recipe is formulated specifically for French Bulldog puppies; so, if your pooch is able to transition from his mother’s milk or a puppy milk replacer, this kibble is a great option to consider. It’s nutritionally balanced and contains the essential vitamins, minerals, and other essential nutrients that growing Frenchie puppies need to thrive; for example vitamin E and Vitamin C will help to strengthen his immune system, while glucosamine and chondroitin will help to support the health of his developing joints. This recipe is made with easy to digest carbohydrates, like brewers rice and brown rice, so it won’t irritate your puppy’s delicate GI tract. It also contains a healthy dose of protein to ensure that those muscles and joints are developing properly. The inclusion of essential vitamins, minerals, and nutrients, like zinc, calcium, sulfate, and folic acid, will help your developing Frenchie grow into a strong adult. This formula I recommended for French Bulldogs that are between the ages of 8 weeks and 12 months. The smaller kibble is perfect for their tiny mouths and growing teeth, too. Final Verdict: If you have a French Bulldog puppy that is under the age of 12 months, Royal Canin Breed Health Nutrition Bulldog Puppy Dry Dog Food is a fantastic option to consider. It’s made specifically for puppies of this breed and will ensure that your growing little one gets the nutrition that he needs to thrive. Blue Buffalo dog food is one of the most reputable brands of dog food on the market. That’s because this manufacturer uses only the highest quality ingredients to ensure that they are providing pets with the wholesome goodness that they need to thrive. Furthermore, they make a variety of formulas to suit the needs of all dogs, and their Life Protection Natural Adult Dry Dog Food is the perfect choice for adult French Bulldogs. Like all Blue Buffalo formulas, the first ingredient featured in this recipe is real animal protein that has been sourced from chicken. This ensures that your pup is getting the right amount of protein to keep his bones and joints healthy. It also contains Glucosamine, which further strengthens the joints; something that is particularly important for adult French Bulldogs, as they are prone to joint and hip dysplasia. Since it’s made with carbohydrates like sweet potatoes and other wholesome, easy to digest carbohydrates, if your Frenchie is prone to allergies or has trouble digesting these ingredients, this grain free dog food is a great choice for him. The infusion of omega 3 and omega 6 fatty acids will also keep his coat and skin healthy, and the inclusion of Blue’s Life Source Bits, which contain a proprietary blend of antioxidants, vitamins, and minerals, will also help to support optimal health. Free of artificial flavors, colors, and preservatives, you can be sure that your pet will be getting the healthy nutrition that he needs and none of the harmful additives that he doesn’t. 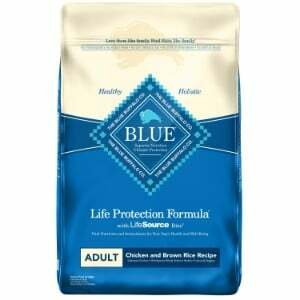 Final Verdict: If you’re looking to give your adult French Bulldog a high quality food that you can be sure will meet his nutritional needs, Blue Buffalo Life Protection Formula Natural Adult Dry Dog Food is an excellent choice. It’s made with nothing but the highest quality ingredients and has an outstanding nutritional profile. Pet parents of all breeds have been entrusting Wellness dog food to meet the nutritional needs of their furry friends. This manufacturer uses the best possible ingredients to ensure that they are serving up the most nutrient-dense food possible. Their Core Natural Grain Free Dry Dog Food is an excellent option if your French Bulldog has an allergy to grains or if he has a sensitive stomach. That’s because it’s completely free of corn, soy, wheat, and other grains that are known to cause allergic reactions, and since this recipe is totally grain free, it won’t upset your four-legged family member’s delicate system. The fact Wellness Core Grain Free Dog Food is completely free of grains isn’t the only reason why this formula is a great choice for your French Bulldog; Of course, like all Wellness formulas, the ingredient profile of this recipe is impressive. Protein is sourced from chicken, turkey, and salmon, so you can rest assured that your beloved Frenchie will be getting the amino acids that he needs to support the development of lean muscle mass and further strengthen his joints. The variety of fruits and vegetables adds to the flavor and further enhances the nutritional profile, and it’s also infused with additional supplements to ensure that your pooch is getting the balanced nutrition that he needs. 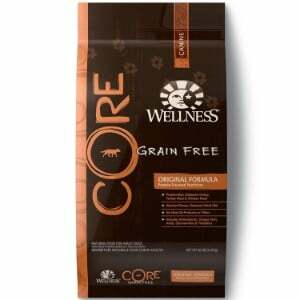 Final Verdict: If your French Bulldog is sensitive to grains, then Wellness Core Natural Grain Free Dry Dog Food is a fantastic food for him. 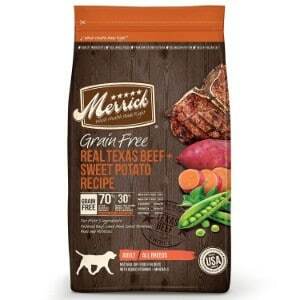 This grain free dog food offers the balanced nutrition that French Bulldogs need to thrive. Last, but most definitely not least, on our list of the best dog food for French Bulldogs is Merrick’s Grain Free Dry Dog Food. Merrick dog food is highly recommended by animal nutritionists and veterinarians, as it is always made with the best possible ingredients to deliver the wholesome goodness and balanced nutrition that dogs need to thrive. Their Grain Free Dry Dog Food is an excellent choice for Frenchies because it doesn’t contain any corn, soy, or wheat, so it won’t aggravate their digestive systems or their skin; two issues that French Bulldogs are prone to. The first ingredient featured in this recipe is natural beef that has been procured from ranches in Teaxs. This beef is carefully deboned and is packed with amino acids, so it will help to support the development of lean muscle mass and keep your furry friend’s joints and bones healthy and strong. Since it’s free of poultry by-products, if your pooch is sensitive to foods that contain this ingredient, you’ll have peace of mind knowing that he won’t have issues digesting this recipe. Other key ingredients featured in this Merrick formula include blueberries, sweet potatoes, apples, peas, and a variety of other freshly grown fruits and vegetables. It’s also fortified with vital nutrients, such as amino acids, omega 3 and omega 6 fatty acids, calcium, and a bevy of vitamins, including A, B, D, and E. There are absolutely no artificial colors or flavors used in this recipe, and since it’s made in the USA, it adheres to the most stringent quality control standards. Final Verdict: If you’re looking for a high quality, grain free dog food for your French Bulldog, you’ll be happy with Merrick’s Grain Free formula. It has a palatable flavor that your pup will love, and it’s packed with the nutrition that he needs to thrive. Just like any animal, balanced nutrition is vital for all canines, as it helps to ensure that they are getting the vitamins, minerals, and other nutrients that they need to thrive. However, it’s important to note that different breeds have different dietary requirements. The type of food that French Bulldogs require varies considerably from other breeds. That’s because they have unique health conditions and their bodies are quite different than other dogs. If you aren’t feeding your Frenchie a balanced diet, the chances that he will develop certain health problems can increase. Therefore, to avoid these problems, animal nutritionists and veterinarians suggest feeding your Frenchie a premium quality food that is specially balanced to meet their needs. Moderate amounts of high-quality protein. Protein contains amino acids, which are the building blocks of muscles and can help to strengthen the joints. Since Frenchies are prone to joint problems, it’s important for them to eat high-quality protein, such as real chicken, beef, or salmon. However, you don’t want to overdo it; if your Frenchie eats too much protein, he could develop kidney problems. Complex carbohydrates are important, but you want to keep them to a minimum. Carbohydrates are broken down into energy, so it’s important that your pooch eats carbs to fuel his energy levels; however, complex carbohydrates are much better than simple carbs. That’s because they take longer to break down and will keep your pup feeling fuller longer. Therefore, they can help your pup avoid weight gain. But, watch the carb intake; too many carbohydrates – even if they are complex – can lead to weight gain. Probiotics and probiotics are important for French Bulldogs because this breed is genetically predisposed to gastrointestinal issues. By offering your pet a food that contains these nutraceuticals, you can help prevent the development of this problems. Just like any animal, there are certain ingredients that you are going to want to avoid giving your Frenchie. The following ingredients can cause adverse reactions and they can even lead to the development of serious health issues. Make sure that you read over the ingredient list before you decide on a food for your pooch to make sure that it is free of these types of ingredients. Exposing your pup to these harmful agents can cause serious problems. There is no doubt that you want to make sure that your French Bulldog lives a long, happy, and healthy life. While making sure that he gets plenty of exercise, is properly groomed, has the right shelter, and is well taken care of are all important parts of caring for your Frenchie; you definitely don’t want to overlook the importance of feeding him the right type of food. Offering him a premium quality food that meets his nutritional needs will support your pet’s overall health, which will support his overall well-being and help him life a much happier and healthier life. Each of the food options listed in our review have been assessed by leading animal nutritionists and veterinarians and are approved for French Bulldogs. Therefore, if you feed your four-legged family member one of these options, you will have peace of mind knowing that his nutritional needs are being met.